Oh, and this is kind of sad: Only this episode did I catch that Orlando Jones' captain is named Irving. As in, Washington Irving, the author of the "The Legend of Sleepy Hollow". So yeah, that character is clearly more involved with things than he seems (I'd bet he set it up so that when Morales called Oxford, Crane got appropriately vetted). This might be my favorite episode of the show yet. Like the previous episode, it made good use of the entire ensemble, and it featured a "this is how things really happened" reveal, which is one of my favorite plot devices (it's why I like heist movies so much). There was a brief period where I was worried that the show actually was going to have Peralta lose the bet; all the better that he won it, but in such a way that Holt won, too. Having Diane on hand, in a ridiculously-detailed costume, but not the center of one of the episode's two storylines, was a really smart move. 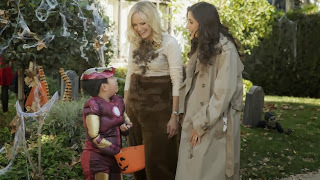 It showed how she fits in amongst the characters without being an antagonist, and the fact that she was willing to put so much effort into a Halloween costume was a great way to show that she isn't isn't all uptight bitchiness while staying true to her character. That said, I was a little bummed that she, Warren and Hilary all fell for the Fox's obvious attempts to manipulate them. Warren, fine; he was doped up on meds. But I'd have thought the others would be too smart. Also, Warren's costume was fantastic. He's such an odd kid, and I love it. Usually, it bugs the crap out me when Top Chef does one of these "we're going to do a challenge themed around a holiday that will be occurring when the episode airs, but is actually several months away when we're filming, so it's all terribly forced" episodes, but this one wasn't too bad - probably because the setting, with all the Mardi Gras/costume stuff associated with New Orleans, helped keep it from feeling too forced (in other words, you could easily do a "costume ball" challenge in New Orleans independent of Halloween). Catering challenges on the show also bug me, but I acknowledge them as a necessary evil. The cheftestants never seem to get too excited about them (which is why, I think, we didn't see much from the season's early frontrunners in this episode: they're good enough to skate by in a challenge like this at this point in the season, but don't care enough to put the effort into winning it), but the whole "work in pairs" bit added a wrinkle that made it more fun to watch (even while it muddied the specific goals of the challenge - it was never terribly clear what the ultimate goal of this challenge was). As celebrity chefs go, Lea Michelle was pretty good. It was mentioned several times that she's a superfan of the show, and she proved it, saying all the usual buzz words while trying the food and intelligently (and specifically) critiquing the results at judges' table (of course, it's possible they just edited her kindly). That said, I'm impressed the show resisted the urge to have her sing at some point. Tom was apparently dressed as Jay Gatsby. I figured he was Orville Redenbacher. Also, Tom, Douchenozzle That Is Called Andy Cohen: it's "old sport", not "sport". The elimination was predictable, one of those "matter of time" eliminations that make perfect sense. That said, the only reason I can think that any contestant on this show would ever do risotto is because they've never seen an episode of the show before coming on themselves. Stephanie is quickly becoming a favorite. Her comment about hanging out with Lea Michelle and it totally not being weird cracked me up. As before, I feel bad for the poor production assistants who had to wrap everything in foil, presumably in only a few hours.I hope all that got recycled. Maybe it's just because this is airing only a relative few episodes into the new season, or because this particular special seemed especially heavy on content from the last five or six years, but man, did seeing guys like Bill Hader and Jason Sudeikis again remind me how much I've missed seeing them on the show. Also, the Merryville Halloween sketch still cracks me the hell up. There's parts of this series' setup I like, even in the early goings - the somewhat novel idea of Dracula being the good guy (or, at least, the less bad guy), working with Van Helsing to bring down a centuries-spanning secret cabal of worse bad guys (I'm a sucker for secret cabal/conspiracy stuff), Renfield being a smooth Alfred-esque manservant instead of a slobbering lunatic, and Dracula being some kind of Tesla-esque alternate energy mogul so he can try and break the economic power the secret cabal derives from oil (ooh, topical! 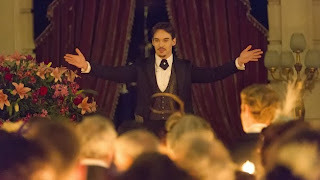 ), but man, Jonathan Rhys Meyers' performance as Dracula, at least in the pilot, is really wooden and lifeless (puns intended). I think he's going for the kind of cool detached confidence that actors like Bela Lugosi have brought to the role, but the end result is pretty limp and uninspiring. There's enough here that I like (or am intrigued by) that I'll stick with the show a bit longer, but man, I really hope Dracula livens up along the way (okay, I'm done punning). Jackie: Can I give you money for this? Kate: Oh, do you have money? Jackie: Okay, so we’re even. Peter: I’ll be with you in a second, Eggs... Benedict... Arnold. We were slightly worried on Top Chef that the judges would actually send someone else home, but then they didn't and we cheered. Because we really didn't like that guy (his name is escaping me right now). We also thought it was a bit BS that Lea Michelle was having a halloween party and everyone dresses up except Lea Michelle, who just put on some cat ears. Same here. I like the mythologies built around Christmas too, actually, but Halloween and Christmas are sort-of each my favorite in a different way. (Yeah, I know, Way to pick an underdog.) And it just dawned on me that there's a similarity. What fascinates me about each of them at the core is how each promises something that you can almost taste when the season arrives but that can never really be, a sense of our material world being visited by echoes of someplace else: a genuine day of complete peace and harmony on Earth on the one hand; a few hours when supernatural realms cross over to ours on the other. Maybe both are ultimately impossible, but I like the way we collectively do our best to sort-of will these very different ideals into being once a year on their respective dates. I didn't get that Pestilence had actually sent Roanoke forward in time. My take was, and I'm a little fuzzy on this since I watched it weeks ago, that the protection of Virginia Dare's spirit also kept the colony hidden from the outside world in a limbo state, and that the (pre-)apocalyptic sign that is the Horseman's return broke down the barriers. Your assumption — if it wasn't already in the televised "text" and I missed it — makes sense though. I've sure been there, so don't feel bad. Actually, I thought I'd mentioned this earlier when I complained that Washington Irving's story didn't actually exist in the "real world" of Sleepy Hollow — Capt. Irving easily could've been the writer's descendant. Heck, Ichabod Crane only being known as a fictional character even could've been explained by his wife or some other person of power magically erasing him from all historical documentation, leaving only the in-the-know Irving's tale as one of the maps, like that sextant, meant to aid Crane or others in the cause when the time came. Early on I think I suspected Capt. Irving of actually knowing about Crane like you, but I quickly switched to suspecting him of more sinister sympathies, and when I heard the disguised voice on the phone I suspected him of being that guy; you can disguise a voice purely for menace, but it's usually because it's an existing character and/or you haven't cast the part yet and it's an important role. From what you say I might make this the episode I use to re-sample the show. I haven't watched this yet. Most reviews from critics and friends are telling me not to bother, but it's more a matter of time. Which is to say, I still feel compelled (no pun intended) to check it out but I may well end up so far behind that I never sample the pilot before the show's short run is over and it's pulled up stakes (okay, maybe that one) unless I hear sooner that things have gotten bloody fantastic (definitely). Fangs bat fog werewolf castle. @Blam: And it just dawned on me that there's a similarity. What fascinates me about each of them at the core is how each promises something that you can almost taste when the season arrives but that can never really be, a sense of our material world being visited by echoes of someplace else ... I like the way we collectively do our best to sort-of will these very different ideals into being once a year on their respective dates. Totally. That's wonderfully eloquent way of expressing what I like about those holidays, said much better than I ever have. So thank you. I didn't get that Pestilence had actually sent Roanoke forward in time. I was a little fuzzy on this detail as well (there are various times on this show where I just have to shrug and go with it), so you could well be right. Most reviews from critics and friends are telling me not to bother, but it's more a matter of time. For what it's worth, I haven't watched an episode since the pilot (and my impetus for watching the pilot was its timing relative to Halloween) so as intrigued as I was my elements of the show, I wasn't intrigued enough to make the time to watch it/push it ahead of other shows. Fangs bat fog werewolf castle.